View basket “Diving Log Book: Under the Sea” has been added to your basket. Our new ‘Under the Sea’ Diving Log Book has an intuitive, fun, graphical layout featuring pieces of diving equipment. This diver’s log is a compact, paperback book format log with a glossy cover and one page each for 50 dives. There are spaces for the essential depth, time, gas, buddy, dive site, visibility and other details, a brief description or sketch plus a dive centre stamp. 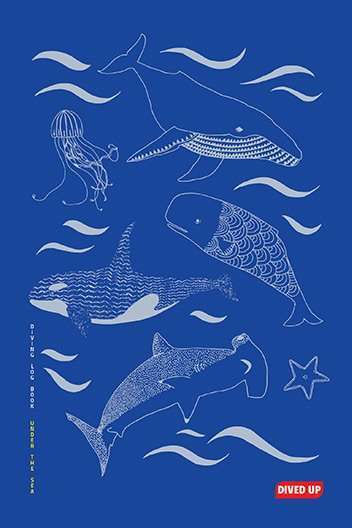 The covers feature original artwork of whales, sharks, jellyfish and starfish by Bristol-based designer Bethan Buss. Small, lightweight, ideal for the travelling diver. Cover artwork by Bristol designer Bethan Buss. If you want a log with more space or a hardcover, have a look at our full range of diving log books.